Sedan-size maps of centuries past weren’t as convenient as our smartphones’ GPS, but without them, we would have been lost. Jay Lester shows off maps the way Ed Sullivan showed off the Beatles. Lester knows that what he has is like nothing you’ve seen before, and he can’t wait to share it with you. 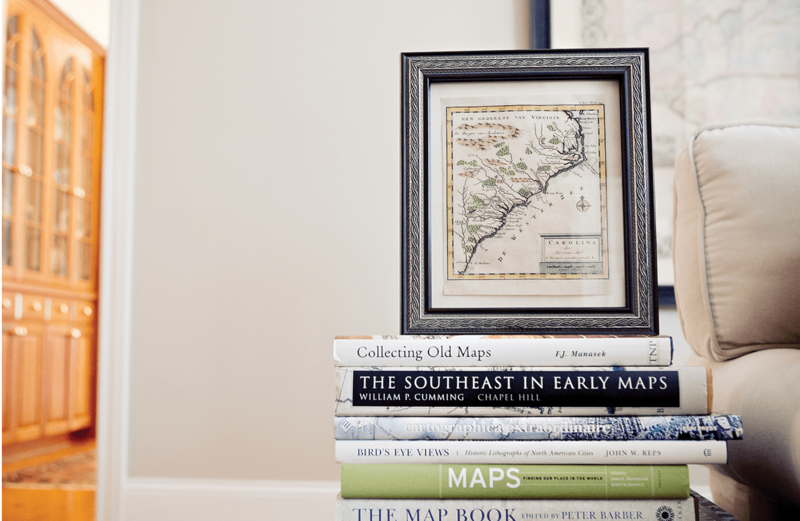 In his office in his central North Carolina home, enormous framed maps of North Carolina cover every wall. Many of the maps are huge — even wall-size — though some are as small as your hand. They’re professionally framed because they’re original historical artifacts — some of his maps date to the 16th century; many are pages removed from atlases, troves of early maps. Virtually all the maps are of North Carolina. Lester has maps from the 1700s, maps with artful pink washes at their borders, maps whose every line bespeaks the soul of their creators. Think of the 1865 edition of William Cooke’s New Map of the State of North Carolina printed by the J.H. Colton company and about the size of your car: With the Civil War just ended and the South in ruins, who would be buying room-size maps of North Carolina? “Why Colton thought there’d be a market for a map this size is just beyond me,” Lester says. Or think of the 1775 Mouzon map behind the piano, which generals on both sides used as their guide during the American Revolution. “The first edition of this map didn’t have Fort Sullivan,” Lester says. Then, in 1776, the British attacked — and failed to take — the fort, so subsequent printings included it in a little inset. Not all the best maps hang on the walls, though. For example, the one Lester gently unfolds in his office: A Plan of the Town of New Bern and Dryborough With the Lands adjoining Contained within the bounds of the Original Grant to Danl Richardson in 1713. A breathtaking sepia-tone sheet, the map is undated, but Lester knows it’s a good 200 years old. It’s obviously from after 1713, since it includes boundaries from a grant in that year, but he knows its original date of publication came in 1817. “We have the mention in the newspaper,” he says. Which would be the New Bern Carolina Federal Republican, which on August 30, 1817, published a notice by one Allen Fitch, the local silversmith responsible for creating the copper plates from which the map was printed. “Those Gentlemen who subscribed to Mr. Fitch’s Plan of the Town, are informed that they are ready for delivery,” Mr. Fitch advised — and, he reported, he also had a few extras to sell if you came around the shop. Just by looking at the maps on the walls, you’re already learning about map restoration, how to identify different editions, and the complexity of the post-Civil War economy. So it’s no surprise that once you actually unfold and touch an old map, you’re also learning about early American printing processes, and newspapers, and what was happening in New Bern in 1817 — and that’s before you even look at the map itself. And it is a thing of amazement. Apart from the wonderfully florid and busy typesetting — the people who made old maps appear to have been paid based on how many typefaces they used — it includes not just the map of the town but also engravings of no fewer than six of the town’s noteworthy buildings: two banks, three churches, and a school — each one suitable for framing, if you could pry the map out of Lester’s hands, which you couldn’t. By now, you’re practically salivating. Old maps! Funky old typefaces and all those curlicues and ribbons and flowers weaving around behind the letters. Engravings of buildings and scenes — Pearce’s New Map of North Carolina, circa 1859, has a border of detailed engravings that includes views of Pilot Mountain, Asheville, the Wesleyan Female College in Murfreesboro, the Salem Female Academy, and two views of the State Capitol, to say nothing of several difficult-to-identify mountains, homes, and waterfalls. And a list of mountaintop altitudes, because why not? North Carolina’s collection of historical maps is almost entirely digitized, as this traipse through the state’s cartographic history shows. Watch this video produced by the author of this story, Scott Huler. Maps radiate not just information and not just rare beauty. They carry something else — a kind of truth, a representation of our places and our times as we showed them, unthinkingly, to ourselves. Look at the North Carolina State Transportation Map hidden in your glove compartment right now. For you, it’s just emergency directions in case your GPS and your phone break down on the same day. But to future generations, it will be a cornucopia of unintended data, the sidelight illuminating our reality like nothing else can. A welcome from the governor, photographs of various landmarks and cities (the 2009-2010 copy on my desk includes Asheville and Pilot Mountain, just like its predecessor by 150 years). All that stuff — the typeface, the distances between cities, the information or decoration the mapmakers think their peers might enjoy — constitutes the essence of what we might call map-ness. Those are the things that make us swoon when the maps come out. In fact, just last January, Sorrell took possession of a collection of maps from a Fayetteville architect who had undertaken to plot on a map the original land grants of what is now Cumberland County. People just seem to like to know where they are — and where things were. “There’s something almost instinctive with a lot of people,” says Bob Anthony, curator of the North Carolina Collection at the UNC Libraries and director of the North Carolina Digital Heritage Center, where almost every one of these old maps is available for you to peruse, in detail, for free, online. Anthony brings Lester along when I reach out to him about the North Carolina maps available through that digital portal. I had asked for a simple little tour through some of the especially interesting maps North Carolinians could see on the UNC Libraries’ North Carolina Maps site. Virtually every significant map of the state — those made from observations of early explorers to Sanborn Insurance maps of every city from the turn of the 20th century to colorful county soil maps from the 1920s that look like Expressionist masterpieces — is now not only online but also carefully, searchably cataloged. Search for your county, your city; look for maps featuring roads or railroads; look for maps with engravings of churches. The riches of North Carolina’s map history are yours for the (free) price of a click. Still, I don’t get on the phone with Anthony and look at screens together. I go to UNC’s Wilson Library and join him in what is called the Vault Room — is there anything more guaranteed to set a heart thumping than an invitation to “the Vault Room”? Here, under the watchful eye of about a million cameras, he and Lester and I gently riffle through some collection highlights. Though mapmakers had not yet even agreed on things like north is up (many maps of Carolina put west at the top, since that’s the general direction people were heading), most Carolinians would instantly recognize maps of our distinctive coast from almost five centuries ago. A map of a city you’ve visited is like the matchbook you bring home from a bar: a souvenir, an artifact, a piece of the place itself. What draws us to maps seems to be something besides their accuracy and intrinsic value. They’re the litter of history, little pieces of evidence of what we think about what we see. In 1890, a map of Orange County carried not just a line representing a railroad but an actual little choo-choo cheerfully puffing along; that tells us something about what we thought of railroads in 1890. The sea monsters on older maps do the same about the ocean. A map of a city you’ve visited is like the matchbook you bring home from a bar: a souvenir, an artifact, a piece of the place itself. Watching Anthony and Lester together go through maps is like watching a pair figure skate, the two communicate so constantly and so well. One brings up maps with drawings of natives, and the other suggests the First Lords Proprietors’ Map, from around 1671, which boasts not only two detailed engravings of natives but also a desert and a vast lake, neither of which ever existed. The desert might be the Sandhills, but the lake is anyone’s guess. Once we’re on the topic of features that exist on maps but not on earth, things really get moving. Anthony and Lester chortle over the various sea monsters that show up in the Atlantic, but they’re more interested in things like the never-existent Pelham County, which appeared on a 1738 map as a sop to a then British Secretary of State, who might have been more likely to pay for a map if his name were on it. Back then, mapmaking was a chancey operation not unlike the modern music industry — the government advanced mapmakers too little, then lent at interest any other funds they needed to produce the work. The mapmakers hoped to recoup their funds through sales, but they rarely did. Early railroad maps often vastly overstated the extent to which railroads existed. Other times maps show the complexity of political life. The 1886 Shaffer’s New Township Map shows counties broken up into townships — a Reconstruction effort to outflank county political control that failed utterly, though the township boundaries still exist, at least on paper. I learn that Tarboro briefly changed its name to Tauboro, which shows up intermittently on maps between the change and the change back. I learn that old maps of the coast are used now to measure the change in the Outer Banks (though we’re not as tolerant as we once were of the fact that they do change). This, then, is what makes maps so satisfying. They are history made flesh, the evidence not of reality but of how we perceive reality — how we represent our world to ourselves, to each other. Explorers, adventurers, artists, engravers — all combine to create these representations of our surroundings, and to some degree, we all agree to pretend that they work. Until we change our minds, and then we make more maps. But whatever we choose to change, the maps exist. They remind us of what we thought, where we were. Which brings us back to that map Lester was showing off in his office. As charming as the map of New Bern is, with its engravings and its descriptions, it has an even more remarkable story. Lester turns it over to show a note carefully scratched on. Charles Folsom of the 24th Regiment of Massachusetts had, on March 14, 1862, participated in the Battle of New Bern. The map “is connected with the results of our late battle,” Folsom explains. “Trophies were numerous but the most vigilent [sic] ones got them.” Like a used book with the names and dates of previous owners, this map carries the story not only of New Bern but also of itself. A map is a trophy, a way to make us feel like we’ve won. It carries its stories in its pictures, its lines, its decorations. It shows us our beliefs, our hopes, our pitiful understanding of a world too complex to yield its secrets so easily. A map is a souvenir, a piece of art, a document. A map is a place, a time, an agreement. Who owns what? Where was Grandpa’s farm? Who’s in charge? Where is the dime store? How do I get there? Can anyone tell me where I am? Maybe. Let’s look at the map. Visit the UNC Libraries North Carolina Maps page at www2.lib.unc.edu/dc/ncmaps.